Sometimes you need to get stuff from your computer to your phone—pictures, files, links, text, etc. And most of the time, that’s way more of a pain than it should be. If you’re tired of uploading files to Dropbox or Drive, emailing links to yourself, or—worst of all—plugging your phone into your computer just to get your stuff from point A to B, stop. There’s an easier way. In fact, we’ve got three easier ways. Let’s get to it. SMS from a real keyboard: Send SMS directly from your computer without touching your phone. 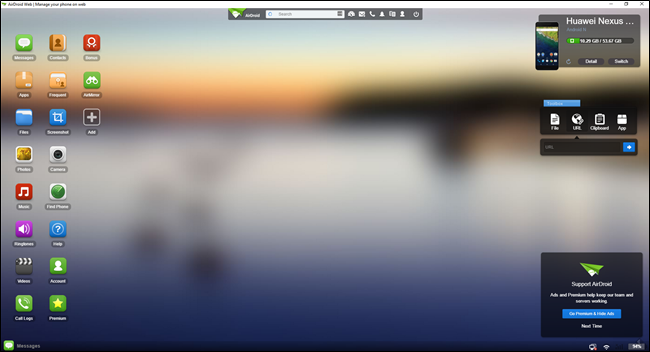 Mirror notifications on your computer: Never miss another notification—Pushbullet will send all notificationss from your phone to your PC. Send links directly to your phone: Skip emailing links to yourself, just push it directly to the phone. And that goes without mentioning things like Universal Copy and Paste—a feature that allows you to copy text on your computer and paste it on your phone. Of course, all this functionality comes with a cost. While the basic version of Pushbullet does offer some functionality—enough for many users, in fact—the best features are all tucked behind a paywall. For example, you can only send files up to 25MB in size with the free version, where Pushbullet Pro allows files of up to 1GB to be pushed. Similarly, Pro allows for unlimited SMS messaging, where the free version is limited to 100 per month. For some users, this basic functionality may be more than enough, and for others, it may not. The nice part is that you can at the very least check out what Pushbullet has to offer to gauge whether or not it’s worth $4.99 per month (or $39.99 per year) for your specific needs. 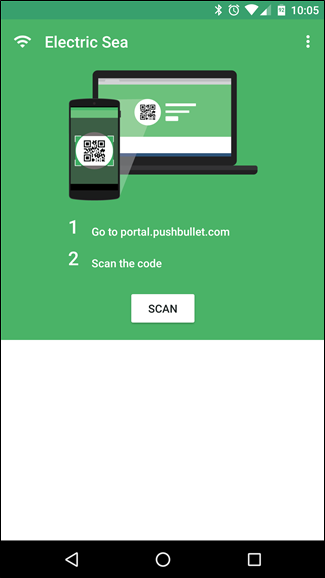 To get started with Pusbullet, you’ll need to download the Android app, and browser extension or desktop application. Manage calls and SMS: No need to grab your phone to respond to a message, just do it from the computer. Mirror notifications: See all your phone’s notifications right on the desktop. Send and receive files: Not only can you send files to your phone with AirDroid, but you can also pull files from it. It’s brilliant. Edit contacts: Manage contacts from the comfort of a keyboard and mouse. Manage music and videos: No need to plug up to manage music. Set ringtones: Change your tones without ever touching the phone. Clipboard share: Copy on the computer, paste on the phone. Remote access the Camera: You can see both cameras on your computer screen. That’s neat. The best part is that almost all of this functionality is offered for free, albeit in a limited quantity. For example, free users are limited to 200MB of data transfers per month, where Premium users have no restrictions on file transfers. Similarly, free users can only have two device connections at any given time, with the Premium account offering support for up to six devices. That said, you can get a bit more out of AirDroid free just by sharing it on your social accounts. There’s an option called “Bonus” that removes the file transfer quota (normally 200MB), allows files of up to 200MB to be transferred, and offers other advanced features that are normally reserved for Premium users, like remote camera access, an ad-free experience, and the option to have AirDroid take pictures when someone tries to unlock your phone. And all you have to do is share it on Facebook, Twitter, or Google+ using “Bonus” method found in the app. It’s pretty simple. If even the Bonus features aren’t enough for you, however, AirDroid Premium is very reasonably priced at $1.99 a month, $19.99 a year, or $38.99 for two years. So, you like the idea of Pushbullet’s easy way of sharing files, but don’t really want the extra fluff? Good news: Portal is the answer. it’s made by the same guys who made Pushbullet, and is essentially just a super stripped-down version of their namesake app. It’s basically just a quick and easy way to get things from your PC to phone. You can use Portal to transfer one file, a few files, or whole folders at one time, and even browse the files and folders you’ve transferred to your phone. Portal is simple, but so powerful. And best of all: it’s free. If you’re not a Pushbullet user, it’s definitely worth a shot. 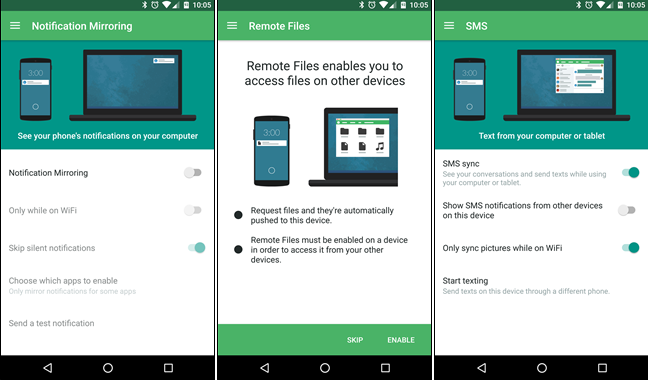 Android is awesome, and being able to remotely manage your files, messages, and more from your PC is one of the things that makes it so great. Depending on how much functionality you’re looking for, you should be able to cover pretty much all your bases with one (or even two!) of these three.